Let’s face it, there are times in all of our lives that we just want to stay put. We don’t want to navigate the traffic or the intersecting major highways, we want to avoid the temptation of grabbing our next meal at the closest fast food joint and instead we want to meander around at a slower pace that allows us to enjoy the finer things in life. This slow down is what vacation should be all about and is exactly what golf and relaxation enthusiasts will find if they elect to visit the Hammock Beach Resort located in Palm Coast, Florida. About 50 miles south of Jacksonville in Central Florida, the Hammock Beach Resort has every amenity any vacationer could possible want to ensure that their days are filled with entertainment, excellent dining and of course the ability to just plain relax. No Florida resort is complete without offering its guests diverse golf options that can be enjoyed within minutes of their lodging. 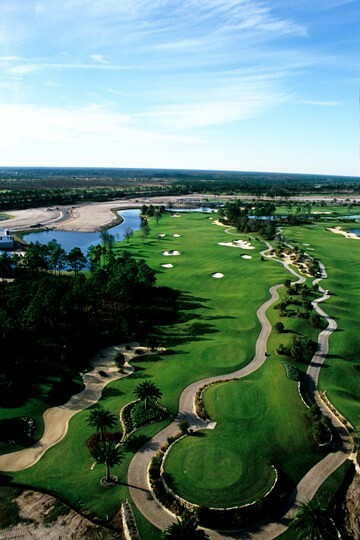 Not only does the Hammock Beach Resort offer two unique courses but these two have been named as some of the greatest and most challenging courses in all of Florida. In order to best prepare for the Tom Watson masterpiece, golfers better hit the range with their driver beforehand as this course does not cheat you on distance. Measuring at an astounding 7,776 yards from the back tees, Hammock Beach’s Conservatory Course , which was opened in November, 2006, forces golfers to pull out the big stick on more occasions than is customary. Although the driver is needed, golfers must also be extremely accurate if they want to be able to challenge this par 72 course that has been named the longest and most difficult in all of Florida. What is unique about Watson’s design is that the layout of the course offers golfers the constant temptation of trying to take large chunks off holes by choosing a line that requires an increased carry over water for each additional yard you wish to cut off. 14 of the 18 holes on the Conservancy course are influenced by water, including the island green par 3 8th hole. Do not get over confident if you are able to hit a few shots that carry a dangerous line as the wind coming off the Atlantic Ocean is sure to punish the over confident golfer. After 17 hard earned holes, golfers are rewarded on 18 with a panoramic view of nearly the entire course on their tee shot. This view captures both the ocean and the beauty of the Conservancy design, which led Golf Digest to naming the Conservancy Course one of America’s best new courses in 2008. Given the distinct honor of being named the “Pebble Beach of the East Coast” Jack Nicklaus’ Ocean Course earns its name based on the constant influence the Atlantic Ocean holds over this masterpiece of a design. Measuring at 7,201 yards from the back tees and 5,811 yards from the front tees, this par 72 course is heavily influenced by water on a majority of the holes. 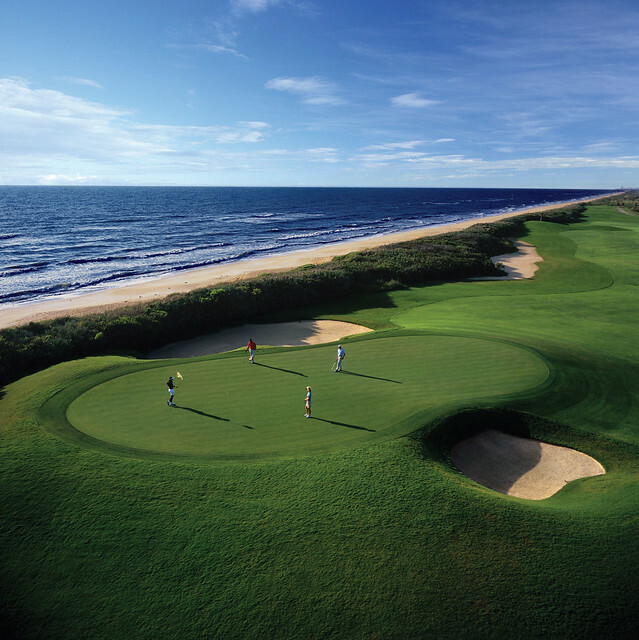 Although distance is not as much of a factor on Hammock Beach’s Ocean Course as it is on the Conservancy Course Nicklaus’ signature design requires golfers to choose their line carefully. Even a slight error, which will be further amplified by the winds blowing off the Atlantic, will wreak havoc on your score. Despite all of the challenges that await golfers on the Ocean Course, Nicklaus rewards golfer’s resolve by finishing with the famed “bear claw” the final four holes that all hang dauntingly close to the edge of the Atlantic. The bear claw’s characteristics are especially accentuated on the 18th, as the Atlantic Ocean follows golfers all the way to finish, serving as the ultimate backdrop in finishing out one of the finest golf courses in all the land. Whether you are on your honeymoon or enjoying a weekend of mayhem with your college buddies, Hammock Beach offers an extensive array of dining options after you have finished your 18 holes of golf. From Loggerheads Lounge, which allows players to cool down with a pint or enjoy a game of pool, to Delfino’s, a fine dining establishment that allows guests to enjoy some of the most gourmet food in all of Florida, the dining options at Hammock Beach are endless. For all of you out there looking for a truly unique experience that caters to your every desire, Hammock Beach Resort allows you to sit back, relax and enjoy the beauty of Florida without ever having to step inside a motor vehicle the best way to enjoy a deserved vacation. If you liked this one, feel free to check out my other Orlando golf course reviews and if you’re looking to play, here’s a selection of discount tee times . I’ve been to Hammock beach resort and it was really a nice place! I’d play well and stay there to relax. Wow, surely we will back to that place. I had an opportunity to play there but instead i decided to go fishing.